Heat olive oil over medium heat. Add in onions and saute until the onions become translucent. Stir, continue to cook until pepper is cooked through. Stir in beans with 2 tablespoon of liquid, lime juice, Worcestershire sauce, and salt/pepper. If you are using precooked dried beans, just add 2 tablespoon of water. Continue to cook until the liquid has mostly disappeared (about 4-5 minutes.) Stir in about half the cilantro and rice. Continue to cook for 2-3 more minutes. 2. While beans cook, poach or scramble eggs. If you want a tostado that is easier to eat with your hands, I recommend scrambled. 3. Next, heat walnut oil and honey in skillet. Slice plantain in 1/2” thick slices and add to oil. Cook on each side for 3-4 minutes until planatin is soft. 4. Finally, heat corn tortillas in a skillet until crisp. 5. To assemble, place tortillas on a plate and pile with rice/beans and eggs. 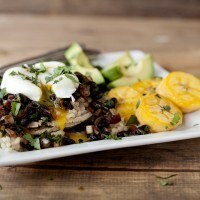 Serve plantains on the side or pile them on the tostada with everything else! Sprinkle with remaining cilantro and serve.